First, an admission: I’ve always followed recruiting very closely. The main reason it piques my interest is the importance it plays on the overall health of the program. Because let’s face it, without good players, you’re not going to win. So I use it as a gauge of the direction the program is headed. So far, so good with Coach Sampson at the helm. Tyler Zeller, please come to Purdue. This is a cry that many people have shared over the recent months. I share that cry with them. 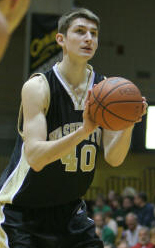 There is a Facebook group pleading to help coach Matt Painter recruit Tyler Zeller. There’s a 25 percent chance he could come to Purdue as his top choices are Purdue, Indiana, North Carolina and Notre Dame. Having Zeller would be beneficial for Purdue in more ways than one. First, dynasty. Zeller is the type of player you could build a program around. Purdue is already making a turn to become a threat in the conference and would only strengthen if Zeller came to West Lafayette. Also, what could be better than making Kelvin Sampson and Indiana look like the losers when Zeller puts on the Old Gold and Black rather than the disgusting Crimson and Crap, err, Cream. The last comment isn’t worth addressing further because it’s the obligatory shot at Indiana by the Purdue fan. Very creative, I must say. Probably took what, three seconds to come up with? Second, the “please come to my school” comments are generally reserved for message board junkies. Not in this case. The student newspaper is begging a 17 year-old kid. Third, I’m wondering how the word “dynasty” made its way into an article talking about Purdue basketball. If anyone wants to fill me in, I’m all ears. In closing, I think we can all agree that Tyler Zeller is a great player. Would I love to have him at Indiana? Absolutely. Would I ever beg him to come to Indiana? Absolutely not. Purdue basketball and dynasty in the same sentence is high quality stuff. I didn’t know you schools with 0 championships could talk about dynasties. On a related note, did everyone see Gene Keady’s going to be an analyst on BTN? Ask yourself this: If Zeller wasn’t ranked no. 22 or whatever in the country, would you really be excited about him. I’m sure he’s a fine player at the high school level, but I’m not sure about his potential at the collegiate level. If he comes to IU great, but if not, it’s not the end of the world. Big A, I saw that article and it made me laugh. Talk about being whiny gee whiz. a dynasty according to that guy since they have not won a Big 10 title in 11 years and no final 4 appearence since 1980. U would know that was a violation considering u guys are number one in the nation in that department. Hell u been number 1 in recruiting violations two years in a row. Speaking of dynastys do they have one for recruiting violations cause IU is looking like a dynasty in the making. Dan, we are talking about phone. Not Reggie Bush getting $280,000 what has the NCAA done about that nothing. Not acdemaic fruad like what happened to Minnesota and Clem Haskins give me a break. IU turns themselves in. What about back in the 1980’s when Bruce Pearl turned in Jimmy Collins when he was a assitant for the Illini? That got Lue Henson in a lot of trouble. I realize that. I’m just pushing your buttons a lil bit. I hate IU but i hope this sactions stuff doesn’t get outta control. I’m excited to see the purdue and iu rivalry beginning a new chapter it might not be the same firey coaches but we both might be getting better talent then ever before and it seems like they are still those hard nose ball players that made our rivalry (in my opinion) the best in the country! This is hilarious. However, beware, because the IDS has a lot of outlandish articles in it too. It is JUST a school paper, at a school where they need every bit of help they can get to even pretend to compare to IU. i love purdue. they make me laugh. on a serious note, it really would be so sweet to get zeller over them. i’d cry too. This is more sad than funny, when a school newspaper has to be involved in recruiting it is a sign of desparation…. I am not for sure but isnt that an NCAA violation for the schools newspaper to try and recruit TZ to them? I dont know if it is or not, just trying to have some fun with it on a slow news day…….. I cant wait for this season to start, I really think this team can win No.6, we have everything but experience and we will have that by the time the NCAA tournament comes around………..
And yeah, the article in the Exponent was pretty lame. Not as lame as Sampson’s excuses about the phone calls, but still pretty lame. Give me a break Matt the Purdue want a be Gene Keady!!!!!!!! I’ll never forget Painter when he said if Eric Gordon had called him about coming to Purdue – Painter would have not taken him. His attitude at Bloomington last year with Callaway. He will never be the Coach that Sampson is. The kids from Valpo are decent but please their not Eric Gordon – Jordan Crawford or Jamarcus Ellis. I don’t know why Painter doesn’t join Coach Weber at Illinois. Two crybabies on the same coaching staff and out of this state would be great. When you look at basketball programs in this state you would rate Purdue behind Indiana and Butler. Are you kidding me. Dynasty?????? HAHAHAHAH!!!! Purdue hasnt won a National Championship in ANY SPORT!!!! When was iu’s dynasty in b-ball? I find it quite funny that most of you are jabbing fun at an article in the Opinion section of the student newspaper. Also, im pretty sure that Purdue has a top 5 recruiting class this year. Gordon is a great player, i give him that. But he won’t do much good, when he is one and done, and jumps to the NBA. When comes to coaches, you think that after all the violations the Sanctions has made, he would learn, wouldnt he?? Im just ready for the IU vs PU matchup, too bad they only play once this year.